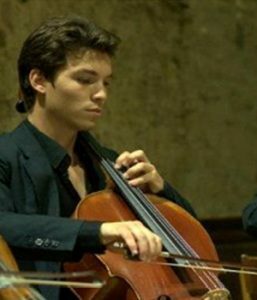 Rafael began cello studies at the age of 5. At the age of 15, he went on to win music competitions and participated in the Young Artist Programme at Ottawa University, conducted by violin virtuoso, Pinchas Zukerman. At 18 years, he was selected to play the Elgar Cello Concerto with the Beauvias Festival Orchestra. Rafael holds a Master’s degree in music from the Conservatoire National Superieur de Musique, Paris. He has performed on French radio and at a number of music festivals in Europe. He is a member of a 7-piece ensemble which is passionate about chamber music, especially performing forgotten masterpieces. He plays a Gand et Bernadel cello, dated1886. Rafael joins MMMF in January 2017.